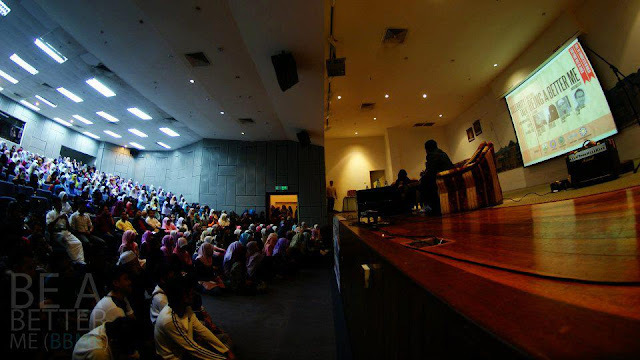 Tuesday: 24 APRIL 2012, PERKIM Secretariat had organized “CELEBRITY TALK : BEING A BETTER ME” in collaboration with KELAB RAKAN SISWA ISLAH MALAYSIA (KARISMA), MAHALLAH SUMAYYAH, MAHALLAH BILLAL and RAUDHATUS SAKINAH at Experimental Hall. Registration started at 8.00pm as soon as the audiences came. There is no problem occurs during registration, but the number of audiences that registered is more than 600. So it is out of our expectation. Therefore, the seats in the hall were not enough for all the audiences and some of them had to sit on the floor and on the both sides of the stage. While waiting for the talk to begin, the audiences were entertained by videos related to the topic of celebrity talk. The program started at 9.00pm with opening remarks by emcee and Quran recitation. Then, Pyan (DJ IKIM.FMas the moderator of forum took place and the celebrity talk begin. First speaker was Waheeda (Actress/ singer), second speaker was Ummi Roses (Director of Raudhatus Sakinah) and third speaker was Sham Kamikaze (Guitaris). The forum was divided into 3 rounds. The first round was about the speakers’ latest progress in their career. The second one was about turning point of their change into better person. And the third round was about something they can get from the turning point of the changing to better person. At the end of our program, Sham Kamikaze was entertained the audiences with his guitar performance.